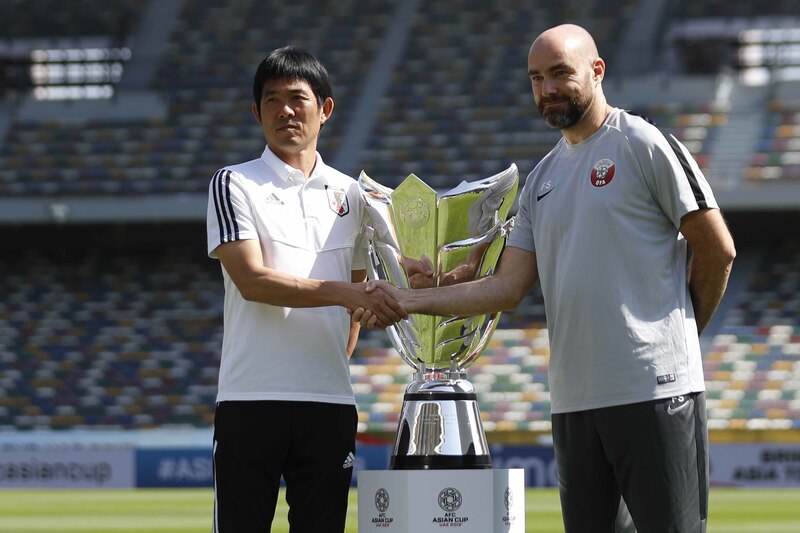 Japan\'s head coach Hajime Moriyasu (left) shakes hands with Qatar\'s head coach Felix Sanchez during the trophy photo call at Zayed Sport City at the eve of the AFC Asian Cup final in Abu Dhabi, United Arab Emirates on Thursday. While Japan have the Asian Cup pedigree, Qatar's over-achieving players might just feel that their name is on the trophy after a record-breaking run to their first-ever final. Against the backdrop of simmering political tension, the Qatari players were pelted with plastic bottles - and even shoes - by furious local fans in a 4-0 semi-final thrashing of the United Arab Emirates in Abu Dhabi. "We have already realised a dream that the whole country had," said striker Almoez Ali, who equalled Ali Daei's record of eight goals in a single Asian Cup against the hosts on Tuesday. "We will need patience in the final but if we are patient, we have a chance of being champions." Japan, who captured the last of their record four Asian titles in 2011, upset tournament favourites Iran 3-0 in Monday's first semi-final and appear to be peaking at just the right time. After threatening to bore crowds to death in their first five games, the Blue Samurai go into Friday's final in the UAE capital unbeaten in 11 matches since Hajime Moriyasu took over as coach after last year's World Cup. Yuya Osako's controversial second-half double floored Iran, and consequently Moriyasu's new-look Japan are suddenly being tipped to go all the way. "We talked about going to war before we came out here," said captain Maya Yoshida, part of the Japan side which scooped the title eight years ago. "We're all fighting hard together for it." Though finely poised, the Qataris have yet to face a team as clinical as Japan - or one with as much tactical nous. However, their progress has been truly remarkable given the abuse Qatar have suffered from local fans because of the long-running Gulf blockade of the tiny, energy-rich state.